* [4-in-1 Technology] Our portable room air conditioner combines the function of a window air conditioner, dehumidifier, heater, air cleaner, and fan. Saving your space and energy. * [Multi-Color VFD Display] Unlike a LED display, a VFD display is an active device providing a brilliant, eye catching glow in a wide spectrum of colors. Generating its own light, a VFD display is brighter than an LED, offers more contrast, and is easier to be read in direct sunlight. 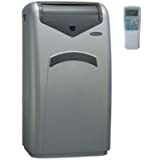 * [No Water Tank to Empty] Includes a built-in 60 pint dehumidifier. The collected moisture is recycled and eliminated through the exhaust duct. For extremely humid conditions, there is an emergency holding tank with a drainage port on back to prevent potential water damage to carpet or floor. * [Smart Chip's Technology] Features digital display on control panel and remote. Computer driven controls give you the ability to program exact setting from the unit or remote. With this feature, you can set the mode, timer, temperature and other setting on the remote, then transmit the information to the unit. * [24 Hour Programmable Timer with Memory] Our unit only needs to be programmed once. The system remembers start/stop time, temperature, and other exact setting even if power is interrupted. The adjustable thermostat with a range of 61-88F, lets you select your own personal comfort level for heating or cooling. * [Energy Efficient Dual Motor Design] One motor delivers cool air while the other motor cools the compressor and condenser. The collected condensation is distributed over the condenser by non-corrosive aluminum fan blades to keep the copper coils cool and the unit more efficient. * [3 Speed Fan with Oscillation ] Recessed oscillating louvers prevent damage to the unit. The added use of a fan enhances cooling and fanning performance, maximizes energy efficiency, and improves air circulation. Our space-saving portable air conditioner cools, heats, dehumidifies, and fans all in one appliance. Includes VFD display technology for enhanced graphics and readability. Evaporative technology means there's no water bucket to empty. Dual hose design cools faster than single hose models. 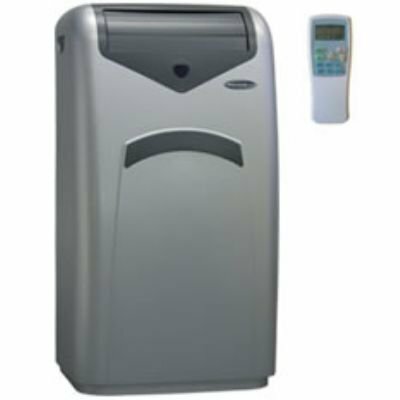 Designed to efficiently cool, heat, or dehumidify any space with no permanent installation. Moves easily on heavy-duty caster wheels. Accessories included: remote control and dual hose venting kit.